Yesterday morning did not work out for a run. The overnight snowfall was saturated with freezing rain and my schedule was too tight to allow time for both shoveling and doing a workout. I was due to give a webinar later in the morning, preceded by some planning calls. Weather conditions were so bad they closed the schools and I figured that was due to the ice covered roads. We only received a few inches of snow so I thought I could easily push it off the driveway. That was a bad assumption. The weight of this snow made it hard to move it more than a couple of feet. A full shovel's worth of the stuff probably weighed over 30 pounds. 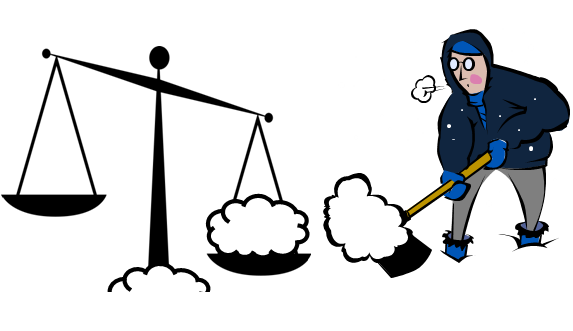 I figured out a way to clear the drive and walk, but it took me three times as long as it did during the last snowfall. After about 40 minutes, my wife was able to join me and that cut the time considerably. No run yesterday, but I did get a good upper arm workout. The still icy roads made the treadmill my only option this morning. I could have also used the elliptical, but I wanted to run. I had an early call scheduled, so I set the speed slightly faster than my comfort level. If everything went according to plan, I'd be able to finish, shower and still have a few minutes before the start of the call. I ended up cutting it close, but I made it. I was very tired by the end. 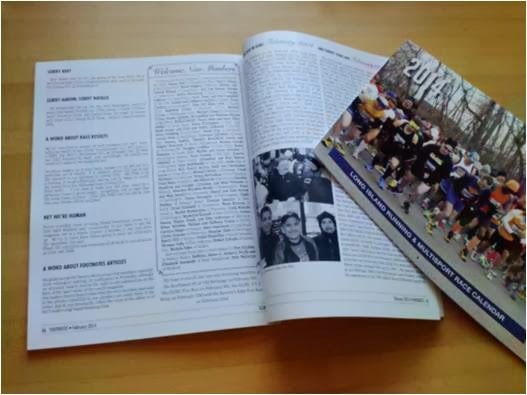 Earlier this week I received my first copy of Footnotes, the Greater Long Island Running Club's (GLIRC) official magazine. That, added to my recently received GLIRC 2014 calendar, made me feel like a real member. It was interesting to see that there are group activities listed in the magazine that don't seem to be on the website (if they are they're hard to find). Looking further, I saw that I was mentioned as a new member. Yay! Me too TPP. I looked for you on the Selden pages in Footnotes. None of us were in any of the Hangover pics! Mrs. ER had company this time : ) Believe it or not, she sometimes goes out to shovel without telling me. I don't know if it's to give me a break or because I get in her way. 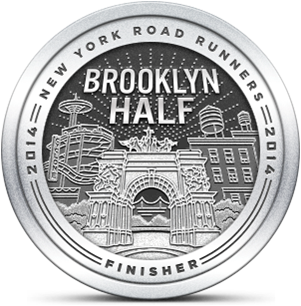 You guys are so fortunate to have such a great running club. I haven't been able to find anything like it in Minnesota...bummer. That's too bad. I was under the impression that Minn had a strong running community. Do you love the magazine as much as I do? The excerpts in the back are interesting reads, usually. Gray, heavy, wet, snow = summer can't come soon enough. What's the long term forecast for Bethpage, by the way? Great question. If this snow doesn't melt off or if we get a lot on Sunday Bethpage could be tough to run. Long term forecast isn't encouraging - temps are supposed to be above 32° toward the end of the week, but wind chills will keep it in the 20's. I haven't got to the back of the magazine yet but I'm going to check it out today.